Synchromesh gearbox is an extension of constant mesh type gearbox. Synchromesh type of gearbox is used over constant type of gearbox because constant mesh type suffers from the problem of clashing of dog clutch due to large difference in speeds of engaging gears. 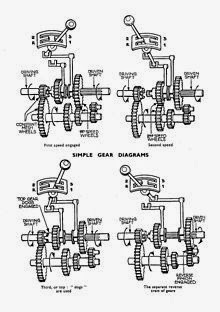 Synchromesh gears ensure initial frictional contact amongst mating parts of gears to equalize speed of gears pair and then push for smooth engagement of dog clutch with gear on main shaft. Its outer end is connected to the clutch disc. The lay shaft is freely suspended in bearing mounted on the transmission case. It has gears rigidly mounted/machined on it. It is output shaft of the gearbox. It has splines cut across its length to accommodate axial movement of gears on it. its outer end is connected to the propeller of the shaft through universal joint. Generally, taper roller bearings are used. These bearings are required to take radial and thrust load during gear engagement. It is a short shaft that supports the reverse idler gears. In synchromesh gearboxes, generally helical gears are used. The selector mechanism employed is similar to that used on sliding mesh gearbox. It provides support for bearing and shafts. It also provides and enclosure for lubricating oil. Generally it is made up of aluminium to reduce weight. It has a vent on its top surface to ensure atmospheric pressure inside the gearbox.